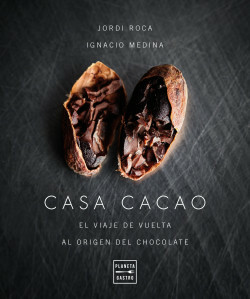 This book aims to show the path followed by Jordi Roca, currently one of the world’s most advanced chocolatiers, in the search to learn how to master chocolate. As we normally understand it, chocolate is a European product. It was in Europe that its meeting with sugar took place which eventually defined its nature. That moment occurred in 1534 in the workshop of the monastery of Piedra, a religious institution close to Zaragoza. Almost five centuries later, chocolate barely guards any further secrets. We know the keys to its preparation, we have learned to manipulate it and we know how to work it according to the use we wish to give it. Until now, this was the framework of Jordi Roca’s work in his chocolate workshop. He worked with chocolates of different origins, prepared in very different ways, in the creation of his own elaborations. Until he decided to go a step further and start a new creative process based on the rediscovery of cocoa. He worked for a few months with white cocoa beans that are grown, fermented and dried in Piura, northern Peru. These are cocoa beans that, once well worked, provide aromatic and delicate chocolates, marked by clear fruity notes. He transformed them into conventional chocolates, but when he began to experiment - provoking new fermentations of the cocoa beans or opening the door to different combinations - he began to realize that he had before him only a tiny part of the whole. This book describes the search undertaken by Jordi Roca from that moment on. The aim is to re-learn to know cocoa in order to continue advancing: a journey from chocolate to the origins of cocoa. The starting point is the chocolate workshop of El Celler de Can Roca. From there, Jordi Roca takes a journey through the history of chocolate that will lead him to the place of origin of cocoa in the Amazon jungle. He travels through cocoa fields in Colombia, Peru and Ecuador to meet producers both in the interior of the jungle - Awajun communities on the Peruvian banks of the Marañon River or Arhuaco producers on the slopes of the Sierra Nevada de Santa Marta in Colombia - and in the new production areas that define some of the most prestigious references on the market. These include Piura, in northern Peru, and the plantations where the Arriba cocoa is grown in Ecuador. He learns about the nature of the so-called creole cacao, native to the Amazon rainforest, the characteristics of the crop and the way in which the cocoa cob ends up being transformed into the fermented and dry bean from which we obtain our chocolate. With this background, Jordi Roca returns to his chocolate workshop in Girona and gives a new twist to his creative work, undertaking new creations with the new cocoas that he has collected over the course of his journey through the different countries of Latin America. The book begins with the creative process of one of his best-known creations as the driving force behind the search for the roots of cocoa and ends with the new recipes he will show both in El Celler de Can Roca, such as the Rocambolesc ice creams, and in his new chocolate shop, which he opened in Girona in early 2018. In 2014 Jordi Roca was proclaimed the best pastry chef in the world according to the 50 Best in the first edition of this award. Little brother of the Roca family at El Celler de Can Roca, his creations have revolutionized the world of confectionery. In Latin America, he rediscovered cocoa after a thorough search for the best cocoa in the world and with this his way of working it until now, a restart and an absolute re-learning of the new possibilities of cocoa. His research (the chocolate industry has never carried out the process he has undertaken) not only affects the sweet creations of El Celler but also the salty dishes of Joan Roca and the liquid harmonies (infusion wines and coffees) of Josep Roca. The book includes some 40 recipes, formulas and totally new creative ideas with cocoa as the mainstay of desserts, chocolates and ice cream. El Celler de Can Roca has been recognized for two years (2013 and 2015) as the best restaurant in the world. It currently occupies 3rdplace. A National Geographic documentary on Jordi Roca’s research on the world of cocoa in Latin America is currently being filmed. Jordi Roca’s journey to the origins of cocoa and its rediscovery for the creation of new totally revolutionary desserts.